Thanks to support from the National Historical Publications and Records Commission, the Oregon State Historical Records Advisory Board has issued a new commemorative poster in honor of this year’s Oregon Archives Month. The 2013 poster focuses on the 100-year history of our public beaches, featuring a pictorial timeline of key moments. Click on the image below to view the poster, and be sure to see the online Oregon Blue Book exhibit “Protecting Oregon Beaches” as well for more historical background information and archival images. Halsey Hendrickson of Saint Helens, Oregon! Her wedding-day photo taken on the beach in Lincoln City garnered more than 1,000 votes, earning her two nights’ stay in an Oregon State Parks yurt. Together, these four images well express the joy and peace people experience on the coast. In fact, we liked them all so much that we have decided to additionally award each of the three runner-ups a 12-month day-use pass good at all Oregon state parks! The four finalists’ photos will be on display as part of the Oregon Parks and Recreation Department’s exhibit at the Oregon State Fair beginning next Friday, August 23rd; please stop by to see them in person. Thank you to everyone who contributed to create such an impressive collection of images celebrating Oswald West’s legacy during this “beach centennial.” We hope to post some staff favorites in the coming weeks. One more week for voting! More than 3100–that’s the number of votes that have been cast since voting in the Celebrate the Shore photo contest opened a week ago. Now there’s one more week left for you to choose the images of ocean shore recreation you think are winners–the contest ends just before midnight on August 15th. Visit the contest page now at http://woobox.com/zeji4t. Remember, you can vote for more than one photo, but just once per day. The winner and three runner-ups will be notified by Tuesday, August 20th. We’ll be posting all four photos online. You’ll also be able to see them on display at the Oregon State Fair, which starts in just two weeks. Thanks to everyone who’s voted so far for helping to identify the images that best represent a celebration of Oregon’s beach centennial. Voting is now open for the Celebrate the Shore photo contest! Over the past month, to honor the 100th anniversary of the Open Beaches Act, we asked people to send in their family photos of recreation on the shore. They responded! We received more than 600 entries. Together, they are a real testament to the significance of the Oregon coast to people’s lives over multiple generations. We appreciate everyone who shared their memories, both old and new, with us. Now, in the spirit of Oswald West’s bill, which declared that the shore of the Pacific Ocean should “forever remain open to the public,” we’re letting the public decide who the winner will be. The photo of people recreating on the ocean shore that receives the most votes by 11:59 p.m. on August 15th will earn its photographer two nights’ stay in a yurt good at 18 Oregon state parks (14 of which are on the coast!). The top three runner-ups or scenic photos will be given Honorable Mentions. All four photos will be displayed at the Oregon State Fair. Click here to view the submissions and weigh in. Each person can vote once per photo per IP address per day, so be sure to come back regularly over the next two weeks to support your favorites. Images will be displayed in a random order each time to promote fairness. We hope you enjoy seeing all of the different experiences people have had at the Oregon coast! Today is the final day to submit your photos of people enjoying the Oregon coast to the Celebrate the Shore photo contest. All entries must be received by 11:59 p.m. tonight; click here to participate. Voting starts tomorrow! There are just two more days to submit your pictures of recreation on the Oregon shore to the contest! Voting begins on Thursday. In the meantime, you can enjoy some historic coastal photographs and take a virtual roadtrip from Astoria to the California line by perusing this online exhibit put together by the Oregon State Archives. They’ve taken the text from a 1940 travel guide to U.S. 101 created under the New Deal-era Federal Writers’ Project and combined it with Oregon Highway Department photographs from the same period. The result is an engaging chronologue of the highway that at that time had just begun to connect coastal communities and draw new automobile tourists to the shore. The Celebrate the Shore Photo Contest is now open! Click here to upload your photos of recreation on the Oregon shore for a chance to win two nights’ stay in a State Park yurt and have your photo displayed at the Oregon State Fair. Online voting begins August 1, so you have until July 31st to submit your entries. Those of you heading to the coast this weekend for Fourth of July festivities, don’t forget to take the camera along! You can read the official contest rules here. Good luck–we can’t wait to see your photos. Take a look at this great photograph shared with us by the Special Collections & Archives Research Center at Oregon State University. 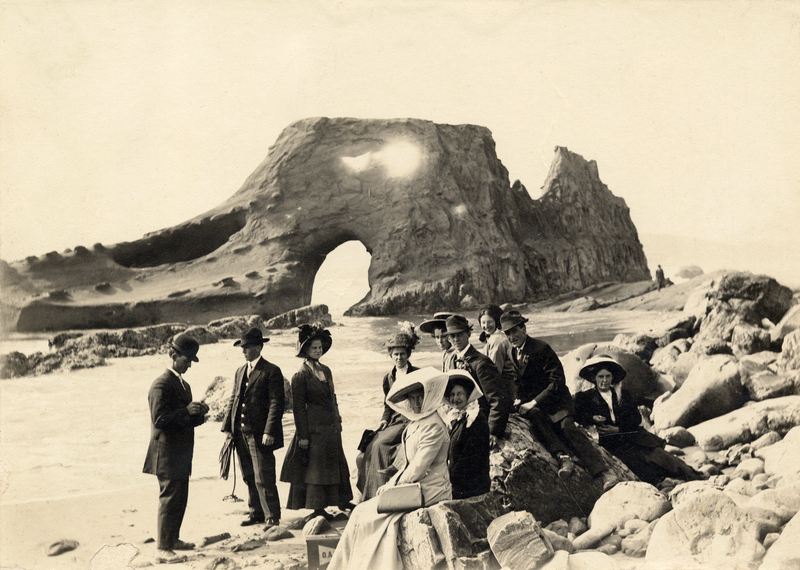 It shows a group of Oregon Agricultural College (as OSU was then known) students on a visit to Nye Beach in Newport in 1910, Oswald West‘s day. This was back when you dressed for an outing with friends by putting on a full suit and a derby or an ankle-length dress and hat with a veil! Although this picture was taken more than 100 years ago, it feels somehow familiar. Perhaps it’s because while beach fashions may have changed over the decades, the tradition of going to the coast has remained constant over the generations. That’s why we’re inviting everyone to share their family photos, new or old, through the Celebrate the Shore Photo Contest starting on Monday–to recognize the common experience and access to the coast that all Oregonians have enjoyed thanks to the efforts of Oswald West and Tom McCall. When the entries are posted online for voting in August, we hope it will be like a big statewide scrapbook of coastal memories. A site dedicated to sharing news and events in recognition of the 100th anniversary of Oregon's public shore. Managed by the Oregon Parks and Recreation Department.